Pallet truck scales were recently commissioned for a supplier of refurbished medical equipment Northmead, New South Wales. 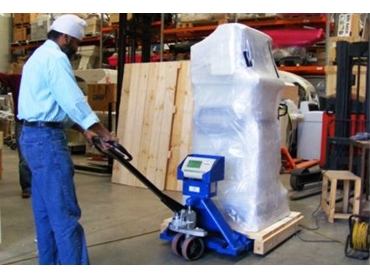 Supplied by Accuweigh ’s Sydney branch, the pallet truck scales eliminated the need for heavy items to be taken to a set of static scales for weighing. The weighing components are integrated into the pallet truck with the digital weight indicator fully protected from accidental external damage by a strong metal shroud. Four heavy duty load cells are fitted into the frame of the pallet truck scales out of harm’s way. Powered by a rechargeable battery, this pallet truck scale can provide extended periods of continuous weighing operation thanks to the use of intelligent power saving functionality. A large 20mm LCD display with backlighting provides the operator with clear and precise weight readings under all ambient lighting conditions. Accuweigh's pallet truck scales are ideal for minimising unnecessary freight movements and can significantly streamline OH&S procedures for weighing heavy items. The units can also reduce labour costs by minimising unnecessary stock movements. Accuweigh are Australia’s weighing experts and have the resources, capabilities and experience to offer solutions for all scales and weighing equipment applications. Superior Product Support is provided by eight Accuweigh branches spread across mainland states.